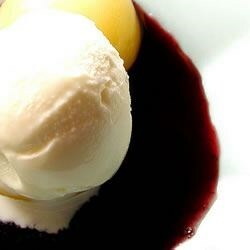 "This recipe recently won 3rd place in a local homemade ice cream competition. It has also been in our family for over 40 years." In a gallon ice cream freezer container, mix together the sweetened condensed milk, cream, white sugar, grape juice, and lemon juice. Pour in enough whole milk to fill the container to the fill line. Follow the manufacturer's instructions to freeze the ice cream. This refreshing watermelon packs a cool surprise! I tried this recipe out of curiousity; I wasn't sure what it would taste like. It turned out to be very delicious, a nice balance of fruity and creamy. I will make it again. I made a gallon of this at a huge ice cream social, and it was the only one with none left over. Ummm...this is so very delicious. I made it last year quite a bit - afraid I would burn everyone out on it - Not so! It's a favorite!